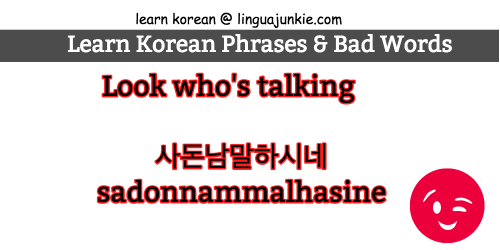 September 16, 2016 by The Junkie 2 comments on "Part 5: Learn Top 15 Bad Korean Words, Curses & Insults"
We’re back! 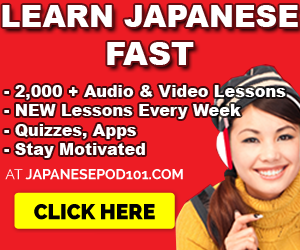 You want to learn korean curses and BAD Korean words, huh? Here’s what I say to you: WELCOME! 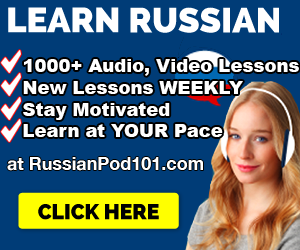 Why am I so happy you’re learning bad Korean words? NONE of these are casual language. Proceed at your own discretion. Again, I Warn You: This post contains bad words. Last chance to leave. Literally this means “off” but it’s not a nice way of telling someone to stop bothering you. Total opposite of “Please go away” in Korean. Ooh, this is strong language and some bad Korean words in there. 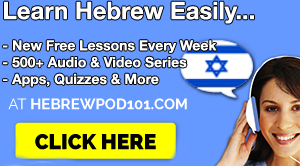 Is someone lying to you? This is the perfect phrase to use when you hear someone talking too much! 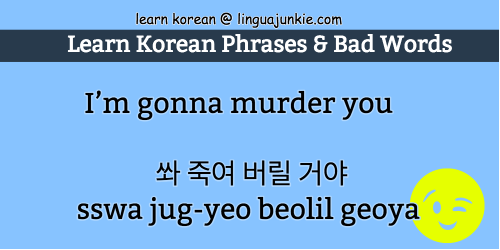 Now, I know you want to be mean in Korean. But some people will be meant to you as well – so, call them a jerk. 4) What is wrong with you? We all have something wrong with us! 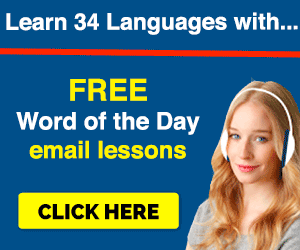 I’m addicted to languages for one. 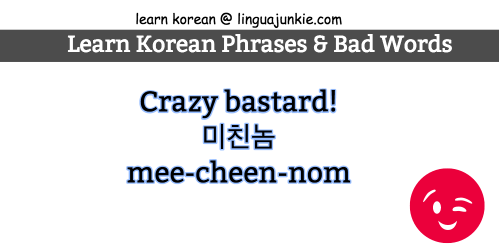 Personally, I think this is a good Korean conversational phrase to know overall. So, what’s wrong with you? 5) Have you lost your mind? Another good phrase to know… when your friend has drank too much Soju and is bouncing off the walls. Yes, they probably lost their mind. Ehm. Definitely not a good thing to say… unless you’re an over-dramatic actor/actress in a Korean drama. Please don’t use this unless you want problems. Bad problems. Ah, now this is a perfect insult. Great for friends. Great for strangers. And great for the nerdy kids in class. Is someone boring you to death? Let them know in Korean! Self explanatory and overall great phrase in any situation. 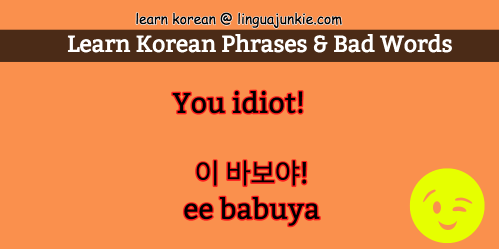 Important word to know – 바보야 – babuya – means idiot. 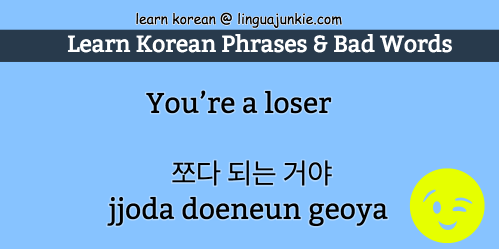 This wouldn’t be a “learn bad Korean words” lesson without you learning how to call someone an idiot. Now you know how to say idiot in Korean! That’s bad Korean words learning progress! 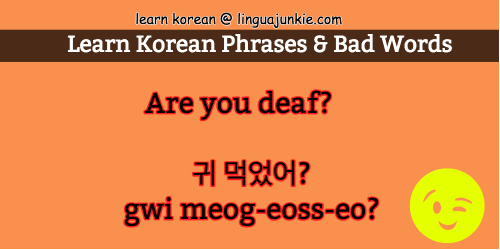 So, you say something in Korean… And they don’t understand you. 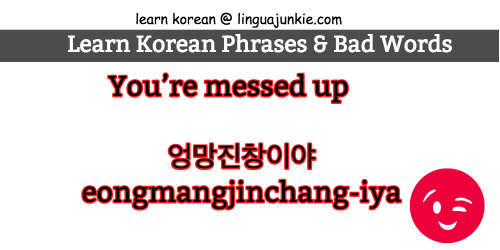 No, it can’t be your terrible Korean skills – you’re damn good and you know it. It must be their fault. Maybe they’re deaf. Maybe they didn’t hear you. Ask them this. Perfect phrase for any nutjob that’s obsessed with anything like, oh say, K-drama, Anime, K-Pop… oh wait, no. I take that back. Anyone that’s obsessed with eating healthy and working out at the gym! Yes! Has someone done you wrong? Did they leave a whoopee cushion under your sofa pillow? Or place a banana peel right under your foot? How terrible. Tell them they’re awful in Korean with this. Now, let’s say your friend did something worse. Maybe they vomited after drinking too much soju. Maybe they overdosed on coffee at Holly’s coffee shop. They’re messed up. Great sarcastic conversational phrase. If someone’s trying to get smart with you – remind them who they are. Oh, I’ll leave you with one more bonus! And that’s it for part 1. Whew. My palms are sweaty from from giving you all these bad Korean words and curses. Stay tuned for part 2. 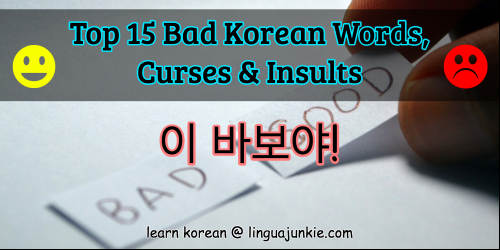 Now, you know the top 15 bad Korean words, curses and insults. Leave me a comment if you want more.